Lyric Opera's production of Benjamin Britten's A Midsummer Night's Dream was pretty to look at but the pacing was very slow. I'm not a fan of this Shakespeare play, which I'm sure the two Shakespeare-loving friends I saw it with would insist is because I have yet to see a good production of it. I found the story silly and dull and Britten's music hard to get a hold on. That left the libretto, lines taken from Shakespeare. Meh. Not until the final song was there anything even remotely approaching a melody. There was a live dog in the production, which, according to the review in the Tribune, performed some amazing trick in the second act. If he did, none of us saw it. Disappointment on top of disappointment, as I'd actually been looking forward to this opera. First intermission at last night's performance at Lyric Opera. I've seen Carmen four times and this production three times now. Carmen, you and I are done. Chicago Opera Theater finishes their excellent 2010 season off with a fantastic production of Three Decembers, starring none-other-than Frederica von Stade. If you're like me, and have missed von Stade since she left the opera circuit, it's a real treat to catch the mezzo-soprano in her final performances before officially retiring. Her voice has long been one of my favorites and she's still got it. Three Decembers is about the relationship of two grown children, Bea and Charlie, to their mother Madeline, a famous actress whom they believe loved the theater more than her family. This one-act opera, by Jake Hegge based on a play by Terrence McNally, is only ninety minutes long, set in three different years, over three different decades. 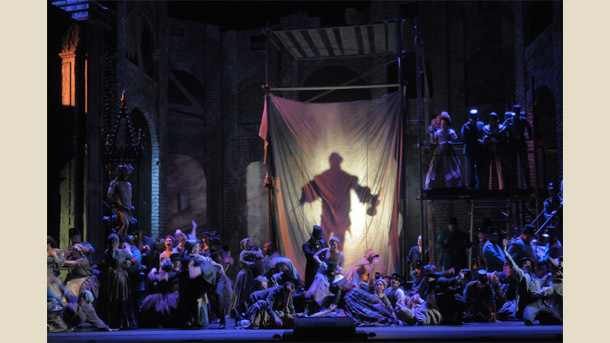 The music is quite accessible, not always true with modern operas. Some of the songs are particularly lovely, especially the duet between Bea and Charlie as they try to conjure up memories of their long-dead father, and "The Moon's Lullaby," sung by Madeline. "Shoes Duet" was another highlight, where Bea and Charlie sing about their mother's obsession with buying shoes as a cure-all for life's troubles. All three performers were very strong in voice and acting chops. Individually, each has a moment to shine and they were magic together when singing the trios. The simple story was given spare yet effective staging, with darkness and spotlight illustrating the emotional void between mother and children as well as the theater stage, where Madeline is most comfortable. The small orchestra, dramatically lit, appears directly on stage. Whether you're looking for the perfect introduction to Chicago Opera Theater (one of Chicago's cultural gems), or you're a fan of the always amazing Frederica von Stade, or you're simply interested in a winning night of theater, I couldn't recommend Three Decembers any higher. But don't delay, there are only three performances remaining. I just woke up from a two-hour nap. Napping on a weekend afternoon is something I never do unless I’m sick. Battling a head cold. Sleep is good. So is Thai hot and sour soup–I call it the “healing soup”–another dose of which I’ll take for tonight’s dinner. I’ll also whip up a fresh batch of Srirracha ginger butter, my magic bullet cure all. The head cold didn’t stop me from attending and enjoying the opera last night, Verdi’s rarely produced early work Ernani. Absolutely ridiculous story but the singing was great, the music pleasant, and the costumes gorgeous. And thankfully it was under three hours long. Today I met friends for brunch at The Publican. I enjoyed my first meal at Publican this past summer when Mike came to town. (Hi Mike!) It was tasty then and didn’t disappoint on the second go-around. This time I managed to snap a few pictures before we devoured the lot. 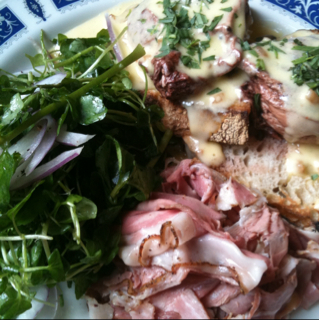 I had the red wine poached eggs with grilled sourdough and bearnaise, lamb pastrami, and a flavorful mix of greens. It was very good and boy, could you taste the red wine. 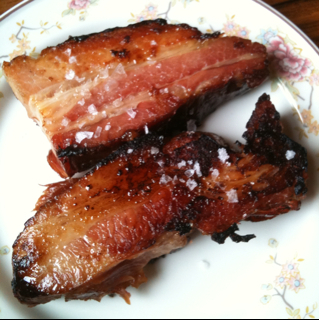 We ordered a side of their signature maple-cured bacon, thick, salty, fatty and absolutely yum! This is a place known for it’s homemade sausages and meats as well as an amazing array of beer and wine. As tempting as it was to order up a breakfast beer, we decided instead to have our holiday dinner at Publican and before you can say “iPhone calendar,” we’d set a date in December. I drink more tea when I’m sick. Lately I’ve been into the Douglas Fir Tea from Juniper Ridge. It smells just like a forest of fir trees and tastes delicious. Finally, all this week I’ve been enjoying a beautiful fall flower arrangement that JD and her family gave me to celebrate my 2 year anniversary nannying the wee one! Two years! The proverbial time flies and all that. It’s an anniversary I’m very happy and proud to celebrate. I’m still so thankful for every day I get to spend with this amazing little person. By luck of the schedule, I had two Lyric operas this week, Puccini’s Tosca last Tuesday and Gounod’s Faust last night. That’s about six-and-a-half hours of opera, my limit for any given week. I enjoyed them both, despite having seen each of these productions before, but I much preferred Faust. I think I may have seen the final performance of this run of Tosca (there are six performances in January with different leads) which might explain why some of the singing seemed overpowered by the orchestra. James Morris (Scarpia) is always a commanding presence on stage and fun to watch. Deborah Voigt has a lovely voice but she’s not a performer whom I really connect with. Her acting seemed a bit stilted, especially anytime she had to move more than three steps in any direction on stage. This is the nearly 50-year-old Zeffirelli production and in my humble opinion, a prime example of enough is enough when it comes to Lyric trotting out the old tried-and-true audience favorites. Give us something new to look at! I realize you should be careful what you wish for but when it’s an opera so often in the rotation, they should really reward long-time subscribers, not punish them with the same old thing. Faust is also a production I’ve seen before, but only once and the performances here were so good I didn’t mind. I’d forgotten how much I liked this opera. The music is beautiful, the staging effective and though the three leads carry much of the story, there’s enough going on (including the use of a large chorus) to keep it from ever getting dull. Piotr Beczala (Faust), René Pape (Mephistopheles), and Ana María Martínez (Marguerite) played well off one another, excellent singers and actors all, especially Martinez who convincingly portrayed the gamut of Marguerite, from innocent love-struck young girl to a woman fallen from grace and out of her mind. This opera has something for everyone (a little dancing, a little comedy, swordplay, the devil, beautiful music, exhilarating choral segments, romance, beautiful sets, and a riveting story that moves along so you hardly notice the three-and-a-half hour running time. A Shostakovich Opera In My Future! 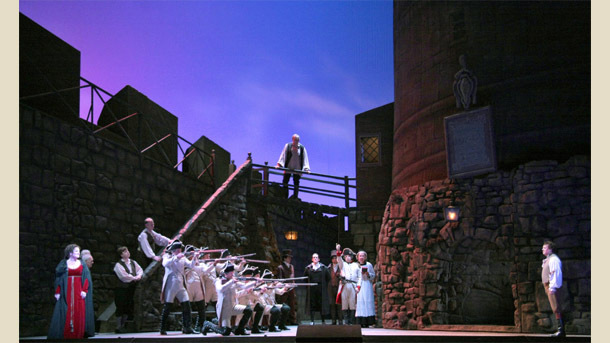 Catching up on my blog reading, I came across some good news from Chicago Opera Theater–the audience choice has been announced and the winner is Shostakovich’s 1959 opera Moscow Cheryomuschki! The bad news is we have to wait until 2011 to see it. Sigh. This past spring, during their most recent season, COT had a very clever fundraising effort going on that allowed audience members to choose the third production in their 2011 season. Choices were Capriccio (Strauss), The Magic Flute (Mozart) and the Shostakovich; one dollar, one vote. Had I ever heard of Moscow Cheryomuschki before? Nope, but attending multiple performances of CSO’s Shostakovich Festival back in ’99 made me a Shostakovich fan and I knew that an opera by the composer would be a must see. Speaking of music marathons, I’ll be spending a fair portion of my weekend at the Harris Theater this weekend, enjoying not one but two productions by Chicago Opera Theater. Rescheduling from vacation landed me with back-to-back Mozart (La Clemenza di Tito) and Bizet (La Tragedie de Carmen). I’ve never seen the Mozart work before. Carmen I’ve seen a couple of times, but no matter, it’s sure to be great. COT productions are as much about the theatricality as they’re about the music. Their tagline isn’t “opera less ordinary” for nothing. BTW, COT scored big for their 2010 season. When the renewal notice came in the mail a few weeks ago, I was thrilled to see that Frederica von Stade (one of my all time favorite performers) will be starring in Jake Heggie’s Three Decembers. Now that she’s no longer a regular on the opera circuit, it will be a real treat to see her next May.